The truly heartening thing to see from this video on the Spanish Riding School is that good horse sense and horsemanship run through everything they do. Although the riders may dress in uniforms from a bygone era, it is difficult to spot anything about their practices that is so old fashioned that it should be left to the history books. Much has been made of the gap between classical dressage and competition dressage of today, but from this video I see much that can be learnt from the past and applied to the competition arena. At the beginning of the video we are given an insight into the management of the young horses prior to entering the Spanish Riding School. Their life appears to be very much in the “natural” vein. The mares and foals run in large herds on beautiful pastures, where they can learn all of the important lessons of equine society. When they are a bit older, the colts run in a large herd in the mountains, and it is a beautiful sight to see them running together, playing games as colts do, and developing strength as they grow. There is much to be said for allowing young horses to get their teenage rebellious phase out of their system in the company of other horses. This must be particularly beneficial for colts, destined to be stallions for their entire lives. I’ve seen far too many colts and stallions with behavioural problems due to isolation from other horses. Another key element in the methods of the Spanish Riding School is surely the patience and empathy they show for the horse in training. The young horse can take from six to eight years to train, and the prevailing attitude appears to be one of setting the horse up to succeed, and patiently working towards the end goal. There is no sense of desperation, or urgency in their work, as there is no judge to impress down at the local show next week and no owners wanting a return on their investment. They know that the methods they use will slowly but surely establish a solid foundation which will ensure a reliable performance horse for the long term. At one stage in the footage they show a young stallion being introduced to his first experience with a rider. The horse has apparently been allowed to get used to the saddle for a period of months, and there are three handlers on the ground to assist the lightweight apprentice who is set to be the first jockey. The horse is then lunged with a rider aboard until it becomes accustomed to his presence. This is an approach whereby the trainer of the horse always looks to the bigger picture. The end goal is a horse that is calmly established in high school dressage movements, able to work in harmony with both its rider and other horses. There are no short cuts here. I am so glad I found this video. I have two great books by former instructors at the Spanish Riding School – Horses Are Made to Be Horses: A Personal Philosophy of Horsemanship by Franz Mairinger and My Horses, My Teachers by Alois Podhajsky (both of which I will review in detail in future.) I was very glad to see the same respectful, common sense approach to horses in the books as in the video from more recent times. This is a brilliant window to the past, where traditions are not just carried on because that is how things have always been done, but because they are the tried and tested methods of over four hundred and thirty years of living and breathing horsemanship at the highest level. 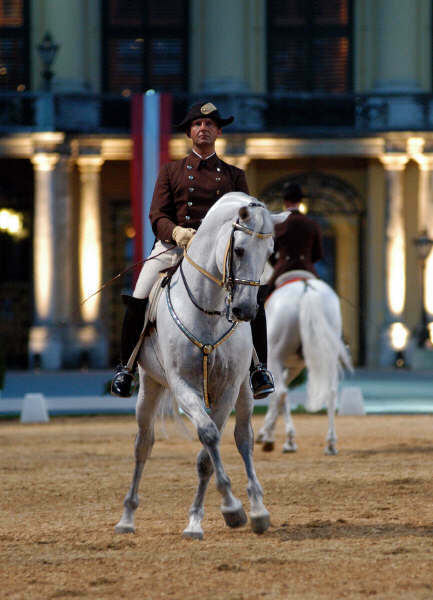 A rider sitting quietly, allowing an unbalanced horse to find his own balance in the piaffe. No frantic nagging of spurs here, just quiet assistance from the ground. One horse receives a food reward for his hard work. And although I don’t wish to spoil the ending for you, I just loved this final quote from the narrator so much that I had to transcribe it. I’ve added it to my collection of horse quotes to refer to in times when I need inspiration. This could so easily apply to the work of every other horse person that I respect. Some of them being high level competition riders, but many being those who work with young and problem horses establishing the lines of communication between horse and human that will set the horse up for life. It’s a great reminder that good horsemanship, in any discipline, comes back to the same basic concepts of respect and empathy for the horse. This entry was posted in Art, Equestrian Sports, Riding, Training and tagged airs above the ground, anthrozoology, big picture, classical dressage, competition dressage, dressage, empathy, haute ecole, horse riding, horse training, learning to ride, observation, really good riders, rider psychology, Spanish Riding School, Vienna by HorseThinker. Bookmark the permalink. Thank you for this, it follows the lineage and instruction I received from my second dressage instructor, who was a friend of Alois’ and had been accepted into the Spanish Riding School..but never went as WWII intervened. Must have been amazing to learn from someone who was exposed to this world of classical training. Over the years I have struggled to find coaching that agrees with the classical principles I have read. Thanks for the comment!